Thai police arrested an Algerian Hacker, wanted by the US Federal Bureau of Investigation for allegedly making millions from cybercrime. 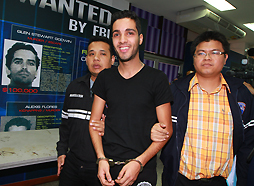 Hamza Bendelladj, 24, was arrested late Sunday while attempting to transit through Bangkok's Suvarnabhumi Airport from Malaysia. Police confiscated from Bendelladj two laptops, one tablet computer, a satellite phone and a number of external hard drives, where satellite phone and notebook computer were his main tools, the commissioner said. Bendelladj graduated in computer sciences from Algeria in 2008, has allegedly hacked private accounts in 217 banks and financial companies worldwide. "With just one transaction he could earn 10 to 20 million dollars," Lt Gen Phanu said. "He's been travelling the world flying first class and living a life of luxury."